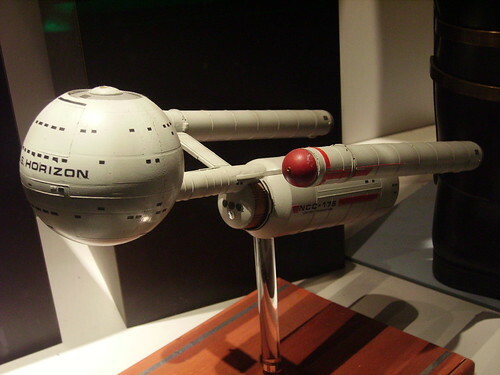 I was just at the Star Trek Experience in Vegas and shot a lot of photos of Greg Jein's Daedalus class model, which he built for The Star Trek Chronology book, and which later appeared on SIsko's Desk (I believe). I've not seen a lot of detailed photos of this, so I thought I'd share. Excuse the fuzziness of some of the images. I was doing handheld in low light with no flash and sometimes my hands weren't as steady as I'd like! Well, from quick glance it appears as though this ship doesn't have an obvious deflector array/sensor dish. Those four windows on the front of the secondary hull look like lounge windows of some sort, possibly for a rec deck or maybe even an arboretum. Fabrux snuck in and deflected my VGS-directed snark. I think those portals are some sort of technology akin to a deflector/sensor thingy. The gold ring around the larger structure has that gold ring around it - I'd say it's part of that whole system. Remember the E-D primary hull secondary deflectors were just those squares on the ventral side of the hull. Couldn't get round to photograph from the back, eh? Oh well. Nice job! Makes me wonder why nobody else ever took pics of it. Great pics particularly the view from below. I don't think we've seen that indent on the "saucer"(?) before. Is that a Danube class above it? I thought they'd sold that off now. Good to see they've kept some of this stuff. Based on the size of the other portholes, the circles in question would be gi-normous windows. I vote for some kind of deflector. Interesting side note... there appear to be windows on the ventral side of the neck too. I'm assuming they're some other detail and just look like windows. Perhaps this could be considered the 24th century's version of an ERTL kit and thus, not 100% accurate to the real thing. SUPPOSED TO HAVE ICE POWERS!! I saw that too... maybe the gravity plating in the 'neck'/'tube'/'tunnel' is different due to the position of the nacelle pylons... or something? Maybe the designer thought it'd be cool to have windows below you - as you walk across a deck made of transparent aluminium! Nice to see some asymmetric detail at the bow. Is that horizontal black line close to the top of the sphere a panoramic window...? Also, "United Federation" rather than "United Federation of Planets". I guess it's similar to US versus USA. The four roundels at secondary hull bow could be anything, but if this is the part where the main engines are, large observation windows are IMHO not a good idea. Perhaps those are cover plates for plug-in antimatter pods? They obviously don't enjoy a field forward. But I guess they could be sensors directed downwards to survey planetary surfaces when this baby overflies them. It has skylight windows too! Must be a pretty nice lounge. Back of the sphere - wouldn't that be an impulse engine? Back of the cylinder - that's the shuttlebay. I'm starting to think that the Daedalus model was supposed to be a LOT larger than the Encyclopedia suggests. Look at the inline image above, and specifically the "right" side of the sphere visually near the starboard warp nacelle. It looks like there's a second row of windows just below the main row. Almost as if the rows of windows are supposed to be for every third deck. That would suggest an intended length somewhere in the realm of 200+ meters, not 100. We also don't know how big thos windows are. They could be small portholes the size of the O shape formed by your hands. "I never agreed with Jefferson once—we have fought on like seventy-five different fronts. But when all is said & all is done...Jefferson HAS beliefs; Burr has none."